The idea for a travel trailer system that I could pull behind my Volvo wagon began when my girlfriend and I first began to conceptualize a move to Lake Tahoe before settling down. We love New England very much, but we also love fresh powder and fun places so we started discussing what it would take to make the move. Our move would be for several years, and we were not looking to relocate all of our furniture and belongings, only the necessary ones. We decided it would be an opportunity to learn how to live simply. In addition to Skiing, I have always been involved in snowmobiling and enjoy climbing hills and making fresh powder turns with my 04′ Polaris RMK. I knew that it would not be realistic to trailer my sled out west with me, and also that the newer sleds being produced these days have many advantages for backcountry riding over my older RMK. Having just recently purchased a single place snowmobile trailer, I wondered if I would be able to somehow modify the trailer so that it could be used to relocate us with all of our necessary belongings, and this was the basis for my creation. Four, Pelican 1660 waterproof, lockable cases. The cases have rollers and a removable handle for easy transportation on the ground. The Pelican Cases are held in place from sliding in three directions with a wood-framed grid. Tongue mounted 1 1/4″ hitch used to mount a two-place Thule Bike Rack. 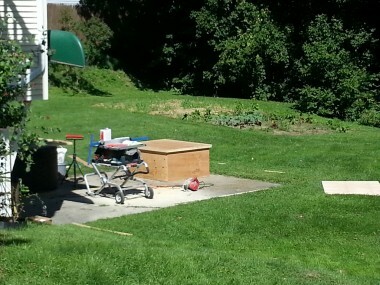 A 5′ x 5′ x 2′ wooden box, the construction of which is outlined below in this project guide. Chris and I constructed the box and lid in a single weekend day. 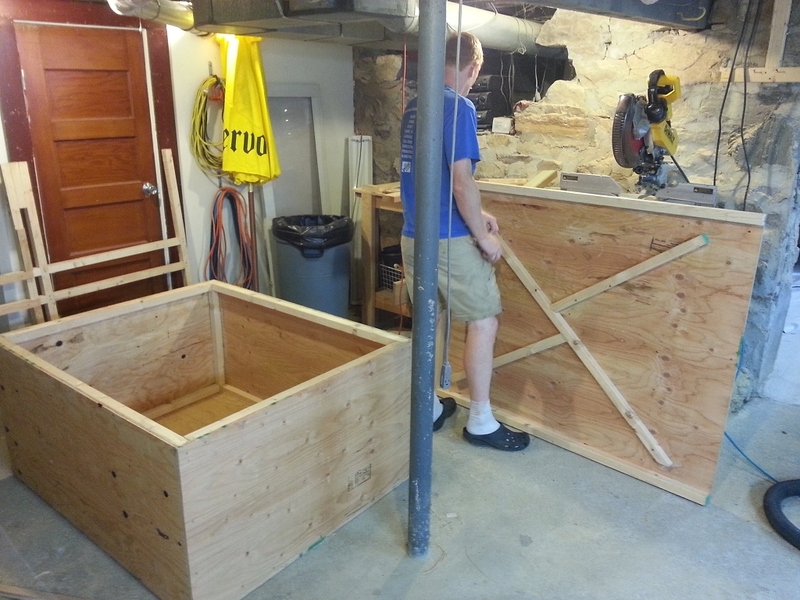 We ripped 2×4’s to square stock and framed out each side by attaching the frame to the plywood sides and then stood them up together and used the factory edge of the plywood floor to square the box. 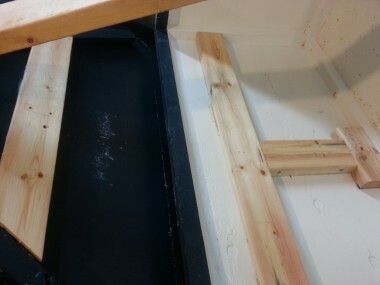 Everywhere the plywood touched the framing, we glued the seams using liquid nails to help weatherproof the box. Here we are building the one-piece grid system that will hold the pelican cases in place on 3 sides. This piece is screwed down with 2″ decking screws, and can easily be removed when the trailer is re-purposed back to its snowmobile hauling designation. 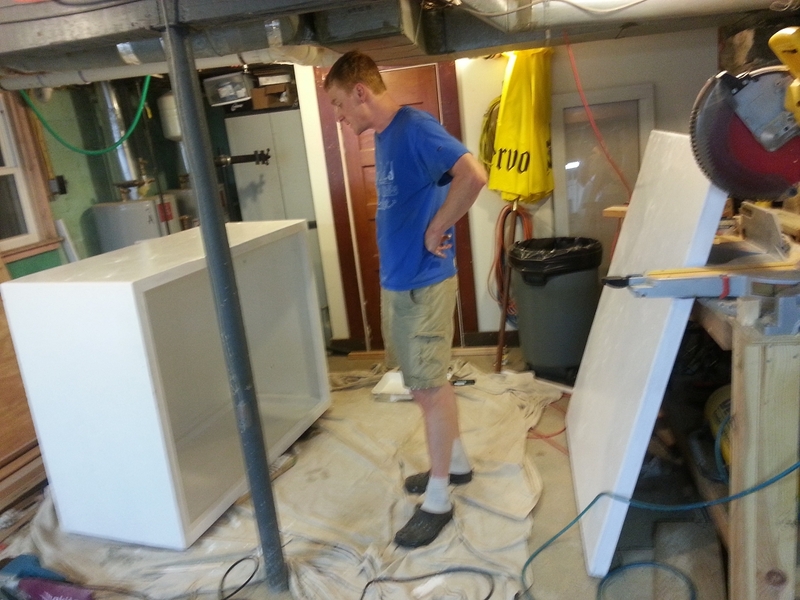 We brought the two pieces inside and applied some primer before we fit the hardware. 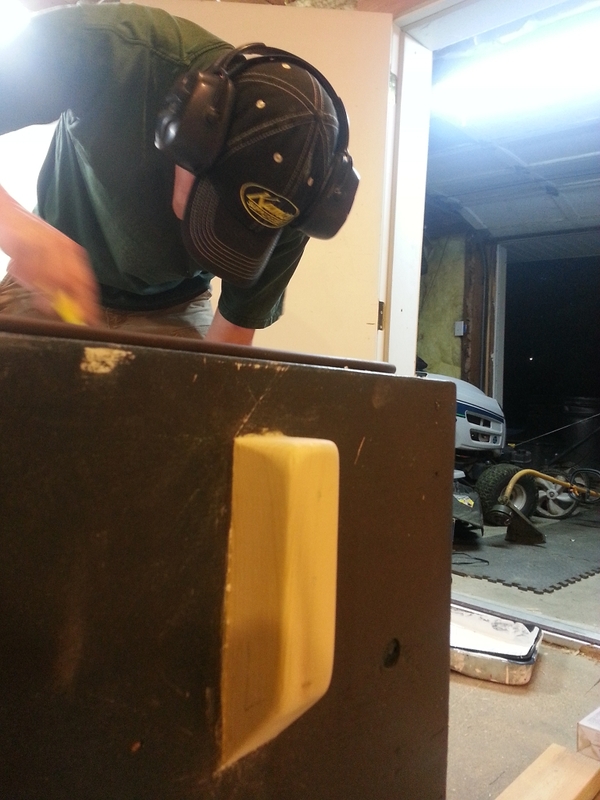 Here we are fitting the hardware to the box. We used two side clasps which lock the lid with downward pressure against the weatherstripping. We originally had weatherstripping running around the entire lid surface of the box, but we experienced binding because we had not accounted for this on the hinge side. Still, the box has been weatherproof in the rain while driving. The unpainted wood in the above photo is our final configuration for the gas piston arragement. We had origionally tried mounting two pistons as you would have mounted on a car hood, but the mount position on the side of the box would cause the piston to want to push the hinges in an unnatural position, and also prevent the front edge of the lid from seating. The power of only one piston was needed, and in mounting it in the center of the box, it will always push the lid forward while closed. This works with the hinges, not against them and ensures that the lid will always seat properly. We experimented with the angle of the piston in order to get a good mixture of up and forward pressure as well as installing additional bracing which helps to limit the stress on the plywood. I purchased a hitch receiver at Tractor Supply for $30 and 220 MIG welded it against a piece of 1/4″ steel stock I got from Van Dyke welding in Ossipee NH. 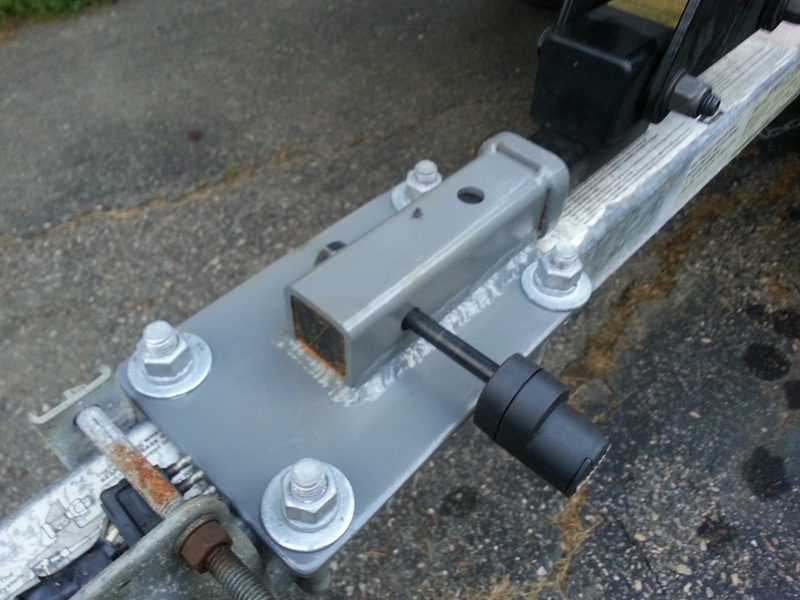 Mounted with 3″ D Bolts, the extra hitch holds the bike rack securely on the tongue of the trailer. At the time of this writing, we are on the road and traveling west. My Volvo V70R is pulling the fully loaded trailer nicely and averaging 20 mpg. The trailer is weighted well, leaving the tongue with about 100lbs of pressure. 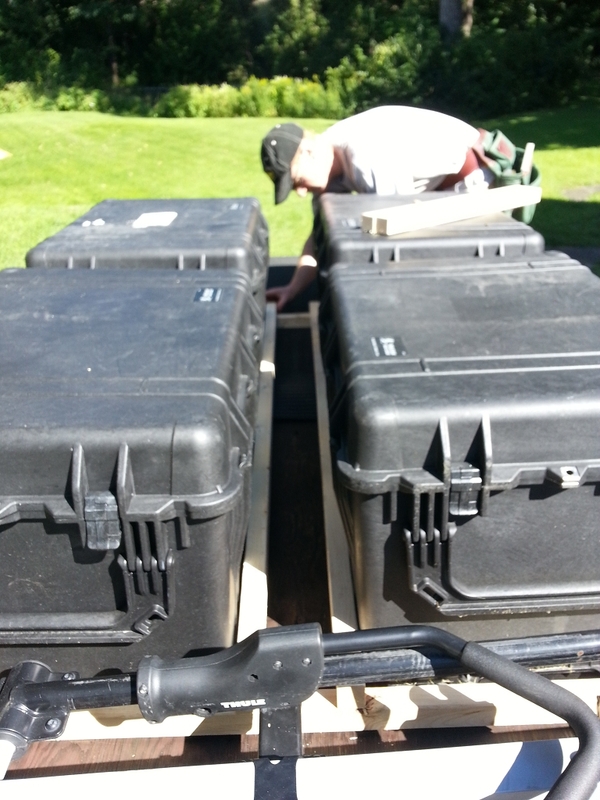 We made sure to put the heaviest two pelican cases carrying vacuum sealed bags of clothes over the center axle. The car itself is not overloaded, with ample space to access things in the back. In the car we have our cooler, inflatable mattress and bedding, and each of our travel bags. The benefits of a trailer is in keeping the car open enough to be able to operate out of as well as keep it light enough to allow the suspension to remain level and prevent unnecessary tire wear. 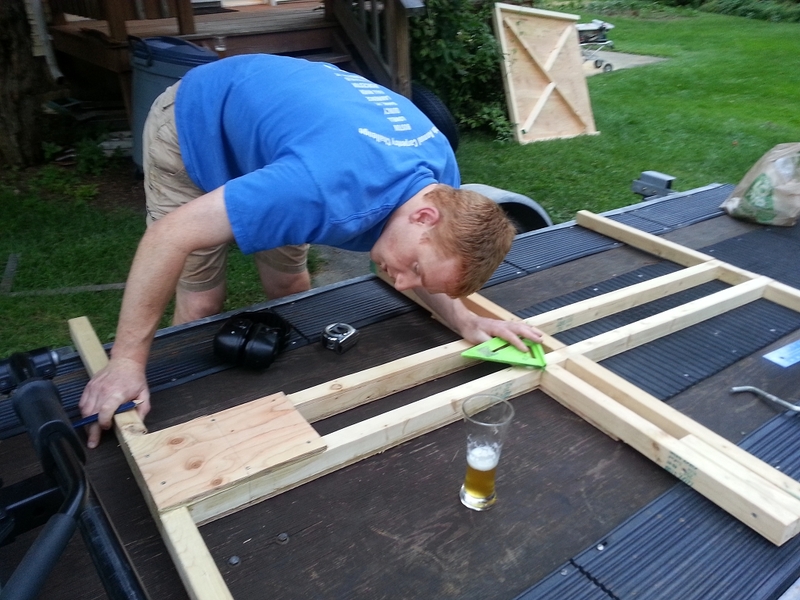 The box and grid system represented the majority of the build time (~30 hours), with a small amount of time spent on welding up the tongue hitch for the bike rack. 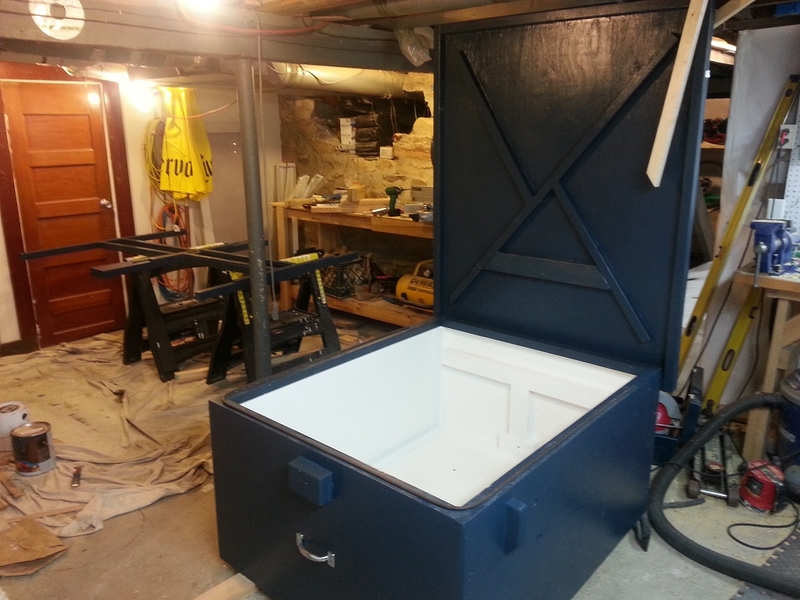 The box could have been much simpler, but the need to have it as weatherproof as possible required us to glue all seams, overlap the lid and install a pneumatic lift added some build time. We got fancy smoothing and routing edges, we primed and painted it with quality exterior paint. The days after we packed the trailer for the first time brought intense thunder storms which tested out the stationary water resistance of all of the boxes. When we checked up on our belongings we were relieved to find them all dry. I’ll update this section after more miles and situations allow us to further test the system but all initial signs point to… pretty sweet! Only needed one gas strut, and the mounting location was critical to keeping the hinges happy. Thanks for checking out this project, I hope it encourages you to consider taking a trip of your own. Take a look at my sister’s Discover the Unknown Travel Project page for inspiration!